46 n Performance & Hotrod Business n December 2014 Show It Off If you have any shelf space in your shop or customer waiting area, be sure to promote winter products over the next few weeks. Display fluids, batteries, belts, injectors, pumps and even signage for your weekly Winter Specials. I used to suggest at least a 4-by-4-foot planogram of products ready for the cus- tomer to buy while they are waiting or shopping. Put them up front when they walk in or by the cash register/counter. Information is crucial about prepping their truck for the winter months; even a photo or two of a truck in a snowbank or on a wrecker enforces their thoughts of "better do it now!" Go to a local quick- print shop and ask for a black and white poster or banner to hang up at the shop, encouraging folks to ask about Pre-Winter Specials, and list a different one for each week of the month. Use your social media to run specials on ser- vices and products for your shop. There are always ways to project your message without spending huge dollars, but it does take some time. There are many different options for products for the winter months for diesels. Ask your local distributor for a list of prod- ucts you know will need to be replaced or used, then ask about availability and whether you need to stock up in advance. If someone is rolling in with a problem, they most likely will not wait a day or two to get what they need to fix it. Be proactive and ready for the diesel trucks that your customers drive, either for work or pleasure. You may want to contact local construction companies and offer a group rate for winter checkups for their trucks. The local municipalities will also have diesels that will need to be ready for winter. Contact the local city garage or manager to push your services. Offer them discounts on weekly delivery of CRC de-gel products or discounts on filters. This is a prime time to make extra dol- lars because when it happens in the winter, people need it fixed now! Ron Knoch is president of DIESEL Motorsports (National Association of Diesel Motorsports), a sanc- tioning body formed in 2007 for diesels that promotes all diesel motorsports associations, clubs and events, and hosts diesel drag racing, sled pulling and dyno competitions. 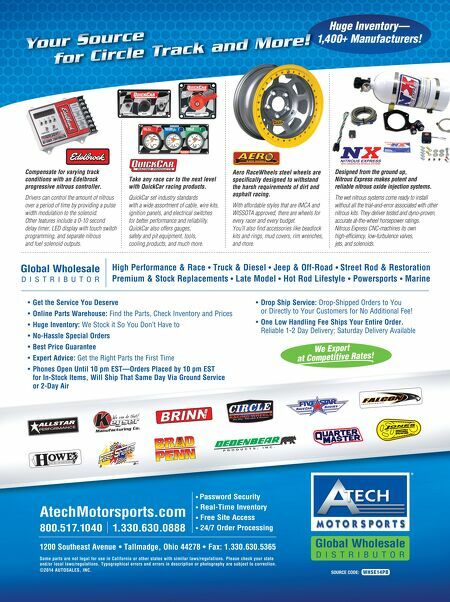 Learn more at www.dieselmotorsports.us. PERFORMANCE Adding CRC de-gel fluid will keep your fuel fresh and flowing during colder temperatures. Drag racing on the week- ends can cause problems for competitors come winter if they have not prepared their truck for cold weather. 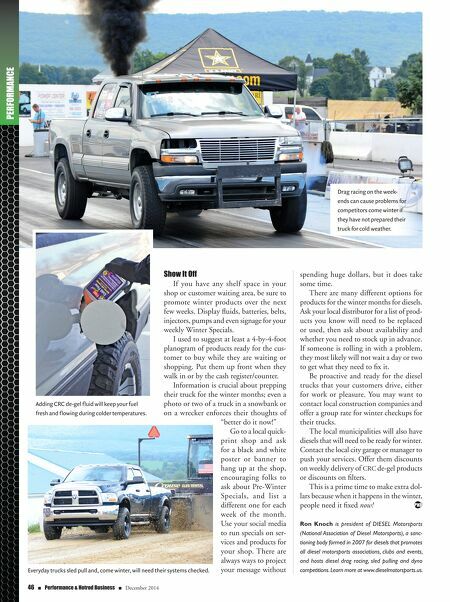 Everyday trucks sled pull and, come winter, will need their systems checked.